During FSweekend 2017, team FlightGear had the privilege to give a number of presentations in a big theatre at the Aviodrome aerospace museum in Lelystad, the Netherlands. One of the presentations covered the launch, engine failure and subsequent return to launch site of a Space Shuttle. Part of the presentation was recorded and can be seen below. Here is a little update of the G1000 emulation. Stuart has now got the key MapStructure layers in place, though they are not styled correctly for the G1000 yet and Stuart would like to replace some of them (airspace in particular) with vector data, and started on the MFD architecture. For prototyping he hacked together a PUI dialog box, which speeds up development massively as it reloads all the Nasal code each time it's opened. 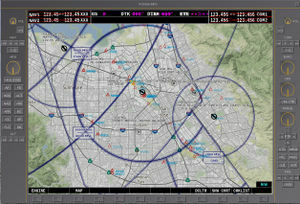 There's also a wiki page of the current status here: http://wiki.flightgear.org/FG1000 Next steps are to get the MFD architecture in place - this will probably require some changes to Richard's generic MFD to support buttons that don't change the MFD pages better. Stuart has not yet pushed this to fgdata - he'll wait until he's happy with the overall architectures so that there is a solid base for anyone else interested in helping out. If you are interested in helping with any of this, and familiar with Inkscape, GIMP or maybe even Blender it would be great if you could get in touch via the FG1000 topic on the forum to see if we can come up with the artwork resembling a G1000-style device, possibly even a 3D model for aircraft developers. Having the artwork in place for creating a simple "skin" would also mean that we could get rid of the PUI dialog and instead use a native Canvas GUI window showing an appropriate raster image with bindings for each button/dial via Canvas Event Handling. Knob & pick animations now support a condition tag. For a pick animation this disables input. For a knob animation this disables both input and animation. The it0uchpods Development Group have continued to work on the IDG-A32X / A33X / MD-11X Professional series aircraft. 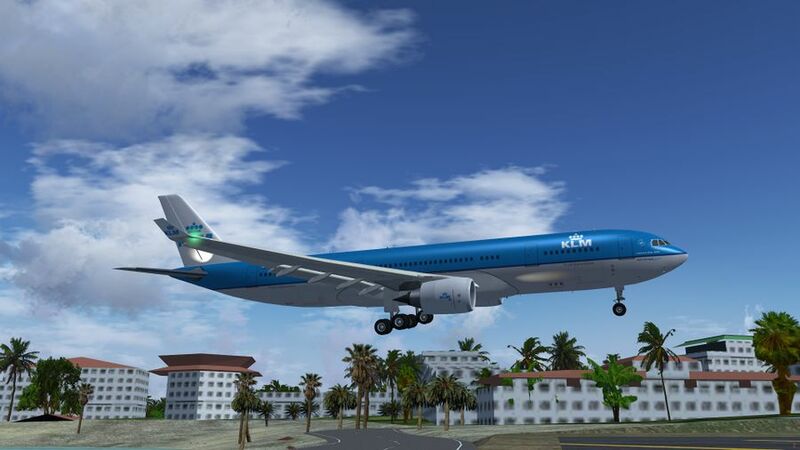 The MD-11X was publicly released on October 29th. It includes a complex pneumatic and electrical system, as well as an advanced autopilot / autoland system. While not as complete as the Airbii, this aircraft is ready to fly, and may be downloaded from GitHub. The IDG-A32X continues to be improved with a new and improved cockpit 3D model by our newest member, TH-555 (Thorsten H). Legoboyvdlp (Jonathan R.) continues to work on the ECAM, with an electrical SD page underway, while it0uchpods (Joshua D.) has created a new (WIP) PFD, which may be accessed from the Utilities > Test Canvas menu. Wecsje (Charlie S.) is currently working on the paintkits, which will be increased to 4096 * 4096 to allow HD liveries. Recent improvements include a fix to the speedbrake logic, double-flashing strobe lights, shadows in the cockpit by kikossousan (Mehdi K.) and a new sound for the CFM LEAP engines. The aircraft's roll characteristics has been retuned to have a more realistic flight behaviour in DIRECT ROLL mode (ALTN / DIRECT laws). On November 4th, 2017, the IDG-A32X turned one year old, and we are very proud with what we have accomplished in that time, and we assure you that there is much more to come! To celebrate this, we plan to have a group flight from München (EDDM) to Hamburg Finkerwerder (EDHI), and then onwards to Frankfurt Main (EDDF). EDHI (Hamburg Finkenwerder) is where one of the Airbus factories is located, and is an airport and seaport combined due to the Elbe river. Most of the A320ceo/neo production line is located there, and there is some nice scenery in FlightGear. Aircraft: IDG-A32X (or IDG-A33X), NO others allowed! Read more at the forum! The Twin Otter now has a JSBSim variant! With FDM data provided by Erik Hofmann from jsbsim.cvs.sourceforge.net and Aeromatic I created a JSBSim FDM for the Twin Otter. Because of my lack of knowledge this FDM flies not very realistic/plausible and should be considered experimental! I see this as a starting point for future tuning of the JSBSim FDM variant. My long term goal is to abandon the Yasim variants of the DHC-6 as soon as the JSBSim FDM reaches a better state than the Yasim FDM because in JSBSim you can do much more fancy stuff. There has also been an update to the various systems of the Twin Otter: We now simulate various electrical buses: Left DC bus which gets powered from Battery or External Power Unit or Left generator, Right DC Bus which gets powered from Right Generator, 26 V and 115 V AC Bus which get powered from one of the static inverters. The bus tie switch has been implemented that connects the left and right DC bus. Also the circuit breakers which have been added and animated in a previous update are now integrated in the electrical system. The lighting of the instruments is now controlled individually by three knobs at the overhead panel like in the real thing. All engine instruments that need electrical power to work are passed through a filter so that they behave correctly in case that the power gets lost. In addition to this there is now a simple implementation of a pneumatic/bleed air system which provides a realistic behaviour of the intake deflectors. You can recieve the update via SVN/FGAddon or via the catalog system once it has been updated. ↑ Stuart Buchanan (Nov 4th, 2017). [Flightgear-devel] FG1000 update . This page was last modified on 10 February 2018, at 09:03.